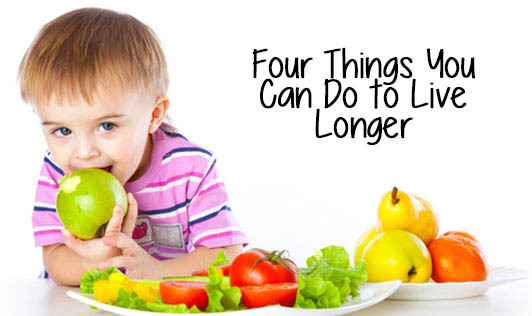 Lifestyle choices greatly affect longevity. Cambridge University researchers studied 20,000 men and women, aged 45 and older, and identified 4 health behaviors guaranteed to increase life span. Emphasizing plant-based foods in the diet, consuming at least 5 servings of fruits and vegetables daily. Research shows that fruits and vegetables are critical in promoting good health. To get the amount that's recommended, most people need to increase the amount of fruits and vegetables they currently eat every day. Fruits and vegetables contain essential vitamins, minerals, and fiber that helps protect you from chronic diseases. Compared with people who consume a diet with only small amounts of fruits and vegetables, those who eat more generous amounts as part of a healthful diet are likely to have reduced risk of chronic diseases, including stroke, cardiovascular diseases, and certain cancers.. Regular physical activity is critically important for the health and well being of people of all ages. Research has demonstrated that virtually all individuals can benefit from regular physical activity, whether they participate in vigorous exercise or some type of moderate health-enhancing physical activity. Regular physical activity reduces the risk of developing or dying from some of the leading causes of illness thus promoting longer life. The effects of smoking on human health are deadly. There are approximately 4000 chemicals in cigarettes, hundreds of which are toxic. The ingredients in cigarettes affect everything from the internal functioning of organs to the efficiency of the body's immune system. Each year, over 430,000 people die as a result of a smoking related disease. According to the American Lung Association, cigarette smoking leads to 87% of lung cancers, emphysema and chronic bronchitis. If you average more than two drinks a day, you are considered a heavy drinker. As consumption increases beyond two drinks, so do the risks to your health. Excessive use of alcohol can damage nearly every function and organ of your body. The major organs that are affected are liver, brain, digestive tract and heart. Individuals meeting all 4 of these basic health principles were only one-fourth as likely to die during the study compared to those not following any of the health principles. This is equal to being 14 years younger in chronological age!